can you buy topamax over the counter check my blog What to expect and your role as Boy Scout Parents. Your Cub Scout has crossed over to Boy Scouts. Now What? Boy Scout Handbook: Buy the cool cover with Velcro closure. It will protect his book and allow him to store items in the zipper pocket. Have him store his book in a one gallon ziplok bag to protect it from water. Please have them fill in their name and additional info on the very first page of their Boy Scout Handbook. Parents read the removable Pamphlet for parents; which is one of the requirements for Scout Rank. Uniform and patches (we provide the “101” patch): Scout shirt, scout pants, scout belt, and scout socks are required for all scout functions unless otherwise notified. Neckerchiefs should be worn while wearing the class A uniform except for camping trips. The boys may vote on not wearing them at all during the summer months but must be worn to and during summer camp. Parents should spend 20 minutes and take the BSA Youth Protection Training. This will allow you to attend camping trips and will help you understands why we do certain things to keep everyone safe. Print out completion Certificate and provide to Troop. Please take an interest in your scout’s progress but have them ask questions and do the work themselves. If you have a family calendar, add the troop 101 calendar date of events or electronically add them by adding Troop 101’s Google calendar to yours. Instructions are listed on our Troop website under calendar. Every year in late March or early April we do a personal camping gear demonstration during a troop meeting. We also may do a New Scout Parent equipment demonstration. Since you will be buying the equipment, it’s best that you attend personally. This will give you the chance to see gear first hand and ask questions. We also require that all new scouts present themselves fully packed the Wednesday before their first camping trip. This way we can be certain he will have an enjoyable weekend. Attending the first camping trip is highly recommended for scouts. The weather is nice and allows the new scout to work out his personal gear. They also get to see and ask questions of other scout’s gear. Parents are encouraged to camp as well (BSA Youth Protection Training required). 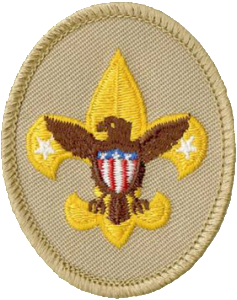 Scouts are required to attend at least two camping trip in order to attend summer camp. Also, if a parent isn’t also going to summer camp then the Scout should attend one of those trips without the parent. This allows to the Scoutmaster staff to be more familiar with your child in a camping environment. The scout should be doing the work themselves; otherwise, what the point. Parents should actively support their scout in such ways as helping him find time in the busy family schedule, driving them to where they need to go, teaching them to be on time, and accompany him when needed to satisfy BSA Youth Protection Training. 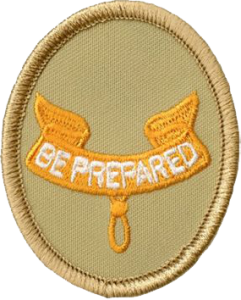 Do not worry about merit badges before their first eligible summer camp. Proper camping gear acquisition, patrol identity and basic scout skills should be their focus. Summer camp is extremely recommended. Besides taking two merit badges and learning many basic scout skills needed for their first three ranks, the boys truly start to bond as a patrol and troop. They also get to elect those scouts that will lead them the following year. 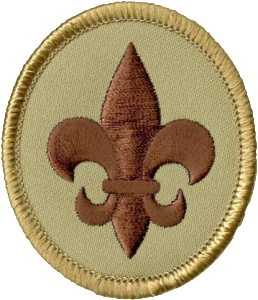 After summer camp we recommend doing one merit badge every four months in addition to 2-4 during summer camp. He should try to do a few less demanding Eagle required merit badges and save the more advanced merit badges for when he achieves Star or Life such as Personal Management. Please remember that the scout should be calling the councilor and doing the work. This is all part of scouting. Below you will see the requirements for each rank and a parent notation as to how you can help your scout. 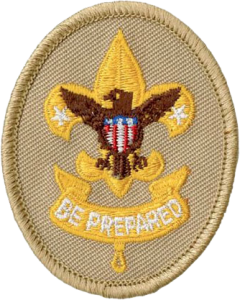 In Boy Scouts, the parents do not sign off on requirements, unlike Cub Scouts. Parents: Help your scout recite from memory the Scout Oath/Promise and Scout Law. We will be reciting the Oath and Law at the beginning of every meeting and on camping trips. Parents: There are usually three dates for the tenderfoot physical fitness requirement. Make sure your scout attends two of the three. Ask you your scout to practice tying the two-half hitch and taunt line hitch. Better yet, ask them to teach you using the EDGE method. Parents: Please buy your scout a simple compass. We highly recommend the Silva Polaris compass and a whistle. Parents: Help your child with requirement # 11 – Describe the three things you should avoid doing related to use of the Internet. Describe a cyberbully and how you should respond to one. All the information is located in the Boy Scout Handbook. This will also give you a chance to make it clear that you will always be there for him if he becomes a victim. Ask your scout to demonstrate tying the bowline knot and describe several ways it can be used.